Based on historical events, Dark Echoes of the Past is the first novel by award-winning Chilean author Ramon Diaz Eterovic to be translated into English. Such a translation is long overdue and will be a welcome addition to the growing number of titles by foreign mystery writers now available to an English-speaking audience. Set in Santiago, Chile, some 30 years after the fall of the Pinochet dictatorship, Dark Echoes of the Past reflects the lingering effects of the torture and the “disappearing” of Chilean citizens perpetrated by that regime’s military intelligence services. Now 50-year-old Heredia, private investigator and protagonist, spends his days reading detective novels, talking to his aging cat, Simenon, who occasionally answers (or maybe Heredia thinks he does), and gazing out his window at the Mapocho River. When business is slow, and it is at present, Heredia reviews books for an obscure journal. When he can no longer stand his apartment/office, he spends time with Anselmo at his newsstand, talking about the week’s horse races and which animals to bet on. A client arrives at his door escorted by his long-time lover, Griseta. Virginia Reyes wants to hire Heredia to investigate the death of her brother, German. The police believe he was killed during a botched robbery, but Virginia believes he was deliberately murdered. Virginia tells Heredia that her brother believed someone had been following him days before his murder, and that he was afraid. Heredia agrees to ask some questions and try to discover what German was afraid of. Heredia quickly discovers that he has involved himself in a case that dates back to the torture chambers of the Pinchet dictatorship, and continues into the present. German engages in uncovering the real identities of those members of the military intelligence services who actually carried out the torture and murder of political prisoners. While a few underlings of the intelligence service, guards, body disposal teams, etc., have been unveiled and punished after the fall of Pinochet, the hands on torturers and those who ordered the torture are still hiding their real identities. Heredia believes that German was about to unmask the real perpetrators when he was murdered. When a witness to German’s murder also dies under suspicious circumstances, Heredia is certain that the motive to both deaths is the desire of former members of the intelligence service responsible for the criminal excesses of the Pinchet regime to evade discovery. Heredia’s poking into the sins of the distant past puts a target on his back, and the guilty from the past are not hesitant to murder the detective if that is what it takes to protect themselves. Along with Heredia, his friend, Anselmo, and his lover Griseta, the most prominent character in the novel is not a person at all, but the city of Santiago. Senor Diaz Eterovic paints a vivid verbal portrait of a city is echoing the effects of a military dictatorship overthrown years in the past. Senor Diaz Eterovic is both an eloquent writer and a profound one, veiling his philosophical musing in humor which does nothing to disguise the sting of his observations. 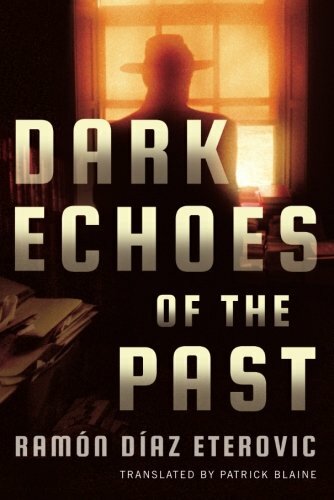 Dark Echoes of the Past is a literary treat for fans of noir, but not so much for those who appreciate a softer, gentler cozy mystery.